I'm sure you're all sick and tired of my leopard print addiction by now but my latest addiction is seasonally appropriate...snow leopard! Ok it's technically still a leopard print but the hues are different so technically it counts as a separate obsession (or so I tell myself!) I thrifted this skirt a few weeks ago at Value Village for a mere $2 (thanks to 50% off member savings day!) and wore it a couple of times over the holidays. Both sets of photos were taken after a light snow fall, we have much, much more snow now if you can believe it! Speaking of snow leopard, check out this adorable snow leopard hair bow I won in Sartorial Sideline's Sproos shop giveaway! I bought this clutch as a Christmas gift to myself (c'mon admit it, we all do that to ensure we get what we really want!) from one of my favourite local designers, Demu. Do you prefer snow leopard or regular leopard print? 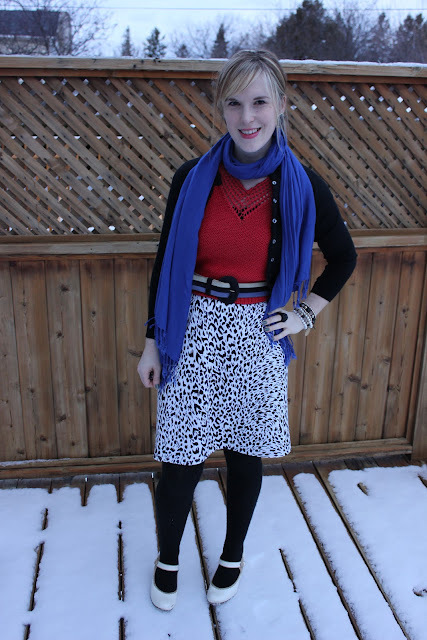 I will never get tired of anyone's leopard print addiction and I love that skirt (Value Village is the greatest, isn't it?)! I love anything leopard print! I have snow leopard shoes that I adore. I do think regular leopard print is a little more versatile though. I adore your new clutch!! hi Emily! any leopard is fine these days. I love it all. both, and I own both kind of pieces. I totally feel you when it comes to leopard print and my next outfit post will prove it. anyway, I just love your second outfit, it's so bright and girly and you've paired those patterns SO well. oh and that bow clutch is such a cutiepie too! you can't have enough leopard! i have a snow leopard scarf that i love. love your skirt Emily and the stripes look great with it. i will NEVER tire of leopard...definitely a staple in my wardrobe! i don't have anything snow yet, althought i have been eyeing a pair of snow leopard toms for a while now! great look! oh, and leopard and stripes is one of my go-to combos!! That's such a cute skirt. I love your second look! I never get tired of leopard. That snow leopard skirt is so pretty. You look amazing. 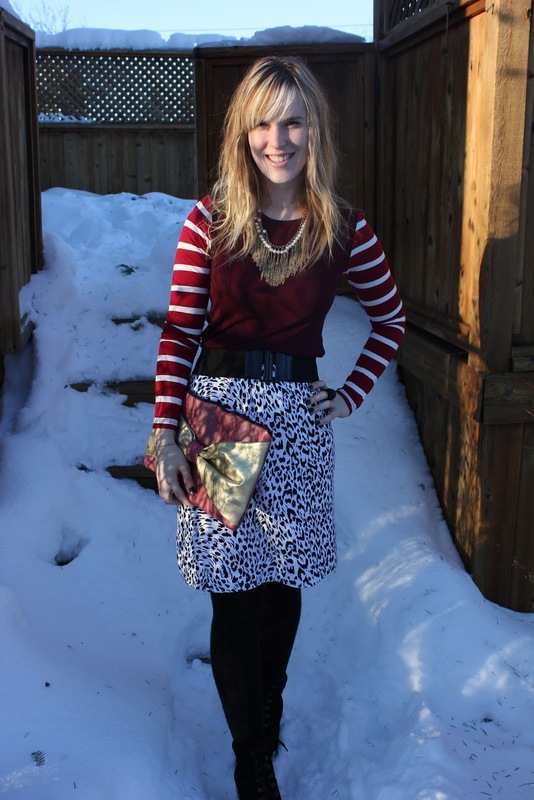 That leopard skirt is to die for! I love leopard print on just about everything :) You bow clutch is super cute!